It packs an ultra-wide lens, 24-megapixel camera and "depth" lens for bokeh. Triple-camera smartphones are officially the new normal. 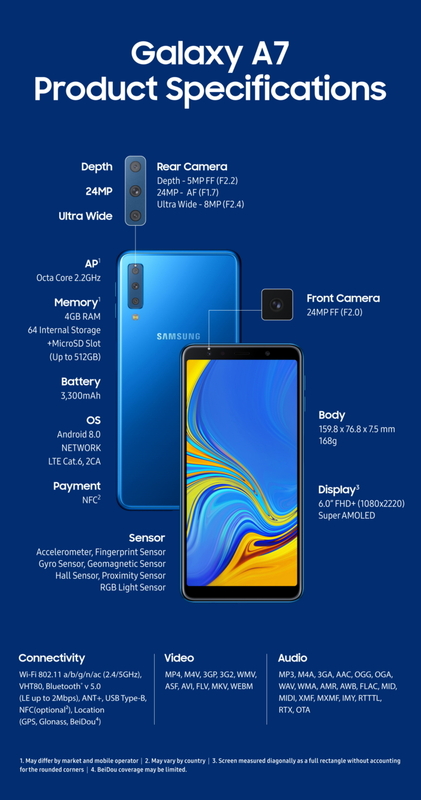 Samsung has unveiled the mid-range Galaxy A7 with three cameras at the rear: an 8-megapixel shooter with an ultra-wide 120 degree lens, a 24-megapixel main camera, and a "depth" lens to give you out-of-focus bokeh effects. The cameras use Samsung's Intelligent Scene Optimizer, which figures out what you're shooting and adjusts the contrast, brightness and color to optimize image quality. The front camera is no slouch either, featuring 24-megapixel resolution, an adjustable LED flash and the "Selfie Focus" effect that brings bokeh to your self-portraits. There's also a pro lighting mode, AR emojis and "flattering filters." The A7 packs a large 6-inch 1,080 x 2,220 Super AMOLED screen, which is nice for a mid-range smartphone. Other features include an 8-core 2.2 Ghz processor (probably an Exynos model), 4GB of RAM (up to 6GB in some markets), 128GB of max internal storage, and a MicroSD slot, again, depending on the operator and market. It's got a side fingerprint sensor, Dolby Atmos sound tech and comes in blue, black, gold and pink. All told, this is a pretty complete mid-range phone that will give buyers a lot of photography power. However, its popularity will depend a lot on the price, which we don't know yet. Samsung has promised to reveal more at a Galaxy Event on October 11th, 2018 at 5PM in Malaysia (5AM ET).